I did a 30 min. lower body workout. It was pretty old school and straight forward. I am going for a walk later, since it's going to be in the low 50s. I didn't watch the Super Bowl, but my husband did. So, I made guacamole for him and I ate my body weight in guac and tortilla chips. I was thirsty all night from it, too. I watched a few episodes of The Golden Girls, meditated, and went to sleep. I had no idea who won until I woke up this AM. My husband did come upstairs at half time to tell me what a boring game it was. Yes. I agree. My husband won't be too happy (if this happens), but my son is 17. He's pretty low maintenance; he makes his own dinner, does homework (mostly) unprompted and graduates next year. So, we're in a different situation than I was 12 years ago where I had to cancel my interview. Go for it and good luck. He's going to graduate next year????? Me 3, I'm hoping @epcotisbest checks in soon! Good morning I did some weights and took a short walk. ok short for me but it was outside. I'm going back out when it warms up just a bit more. Current weekend workout (if I'm able to get it in) is usually 1.75-2 hours. It's not as bad as my true gym rat days or when I was distance walking. With the distance walking, I'd leave the house around 7-8 am on a Saturday and come back around lunch! It's funny, because there are times when I'm in the quad mode where I will remind myself that I am not Flo's sister. Which is also funny since a former coworker used to call me Janice...a Friends thing based on my previously strong NJ accent. Got my walking outside 2 days in a row! It was in the upper 60s yesterday but today hit 72. I really am done with cold weather. But this weekend’s highs are 40s with lows in 20s. Brrr! We went up to 82 yesterday. 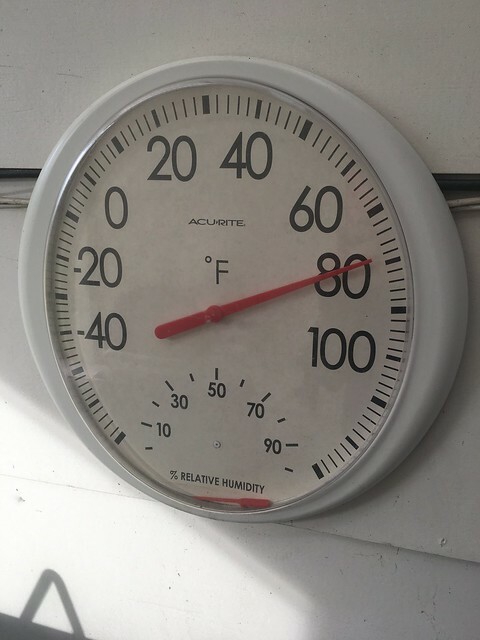 I didn't even take a pic of the thermometer until it had dipped down into the upper 70s. Yes, the relative humidity portion is broken...probably too many days around 100%! My body isn't ready for these spring/fall temps just yet. I've been getting through my workouts, but I'm sweating like crazy and needing hydration like it's upper 90s+ out there. We have a front going through today though and it'll be taking us back into the 40s, which should make for a chilly Saturday of softball, but more comfortable workouts. 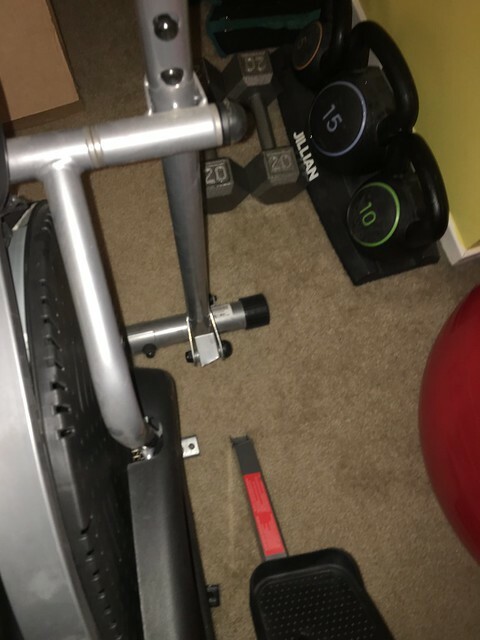 I still have plenty of other things to use, but thinking about a reasonably priced replacement since I've always liked an elliptical workout. At least you get your money's worth out of your equipment! Most people use stationary equipment as clothes hangers and dust collectors. Yes. It's crazy how quickly the time flies. We moved here just before he started HS. It doesn't seem like that long ago. I was able to get out 2 days in a row without a heavy winter jacket, hat and gloves. It was beautiful, but I know the potential for late winter Nor'easters looms in the background. Just keeping up with the usual workouts. I got a new, fancy-pants, Swedish stand mixer as an early Valentine's Day present today. As soon as I figure out how to use it, I'm going to bake some bread. I'd been using an electric hand mixer and my food processor in place of a proper stand mixer. I tried making pizza dough in my food processor, but it started smoking. So I went back to hand kneading, which wasn't the end of the world, but it can take a long time to work the dough to where it needs to be. It's just built differently than a Kitchen Aide or a Cuisinart stand mixer, so I think a learning curve is involved here. Of course, I am cynical enough to think my husband gave it to me early so I'd be able to make a nice cake for Valentine's Day. I got a new, fancy-pants, Swedish stand mixer as an early Valentine's Day present today. Is it an Ankarsrum? They look pretty cool and they get glowing reviews. How's the footprint compared to the Kitchenaids? Not that I need a new mixer and I have very few complaints about mine, but everyone is always griping about how much space it takes up. I did an hour long power yoga class. I started out doing one, then I had to switch out. The first class was nothing but variations on planks. I don't mind doing planks, but I refuse to do 50 minutes of planks. It's boring. Plus, three minutes in, she went into "wild thing" over and over. I think I need to cancel this subscription, because I dislike more classes than I like. It's too bad because I like her and her personality. I am also going to walk with my husband later on, once it "warms up" to the high of 35.